The City of Oakland now has six operating medical cannabis dispensaries with the August 1 opening of Magnolia Wellness at 161 Adeline Street. Magnolia joins fellow operators Harborside Health Center, Purple Heart Patient Center, Oakland Organics, Coffee Shop Blue Sky, and Blum. Magnolia and Blum struggled to find a commercial space to lease, as cannabis remains a federally illegal drug. The Magnolia organization originated in Sacramento, but closed due to a nearly two-year-long, joint federal-local crackdown on dispensaries in many parts of California. For example, widely maligned US Attorney Melinda Haag is trying to seize properties leased to Harborside Health Center in Oakland and San Jose. The City of Oakland and Berkeley are fighting back against Haag and have won several significant legal victories. California law allows for medical cannabis patients, their caregivers and collectives or cooperatives of such individuals to grow and sell the pain and nausea botanical. Oakland regulated medical cannabis dispensaries in 2004, virtually eliminating unregulated dispensaries by permitting four regulated ones. In 2012, Oakland increased the number of allowable dispensary permits to eight. Magnolia was one of four applicant groups to win new permits. Open 10 a.m. to 8 p.m. seven days a week, the new club carries ten indicas, eleven sativas, two "organic" strains. 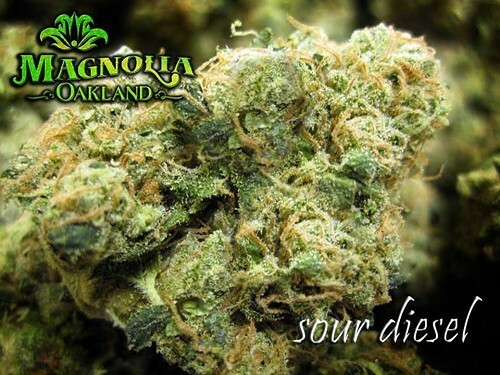 Today's Strain of the Day is Sour Diesel — $25 per eighth with the purchase any other eighth at regular donation price (limit one per patient). Magnolia Wellness also won Best Booth at the 2013 High Times Medical Cannabis Cup in Richmond. Correction: The original version of this post misstated the number of permitted medical pot dispensaries that are open for business in Oakland. There are six.